Like any windows app, OpenLP is started by clicking on its icon on the desktop. If you are using an older maching you may have to double-click. OpenLP can be slow to start up: do not despair prematurely! 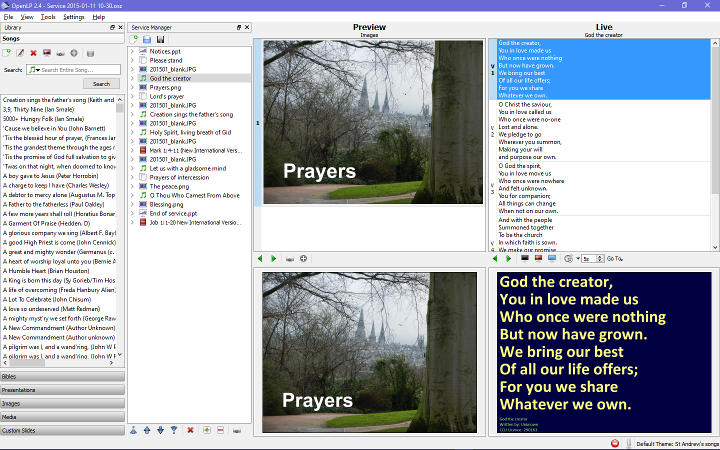 After OpenLP starts you should see a desktop similar to the screenshot above, with four side-by-side panels headed Library, Service plan, Preview and Live. If so, you can skip to the next section. If Library is not visible, press the F8 key. If Service Manager is not visible, press the F9 key. If Preview is not visible, press the F11key, and if Live is not visible, press F12. If extra panels are visible, press F10 to hide the Theme manager or F6 to hide the Projector manager. You will not need either of these. If you now have the desired 4 panels visible but they are not arranged as in the screenshot, you can move them around by dragging the title bars of the Library and Service manager. To load the correct service plan, go to the File menu and click on Open service. You can then see a list of service plans with names like 'Service 2015-01-11 10-30.osz'. Choose the appropriate one. Note that the slides have not been copied off the memory stick: it has to remain in place for the duration of the service. Use the same process to add a sound or video file, selecting the Media bar in the Library. For sound, alert the sound operator that it will be present on the blue fader labelled 'PC', and that the red pre-amp control near the top of the fader channel needs to be turned up to a suitable level. You should rehearse the plan before the service. To start doing so, double-click on the first item in the service plan. At any time you can double-click on an item in the plan to display it immediately. The background of the item will turn grey in the service plan indicating that it is live. This is important: if you want the service plan to be displayed, check that that the desired item has a grey background, or double-click on it to make it grey. When an item in the service plan is grey, to move to the next item, use the right-arrow (→) key on your keyboard. If the item contains several screens, for example a hymn, use the down arrow (↓) key to move to the next screen (or verse). To move back to the previous item use the left arrow key (←) and to move back to the previous screen or verse within an item use the up arrow key (↑). If the plan needs to be changed, please use the tutorial pages listed below to help you make the changes. Don't forget to save the changed service plan either using the File menu or the black disk symbol just below the word 'Manager' at the top of the Service manager.